It is not fair to brand the first war of Indian Independence as a mere sepoy mutiny. The unrest among the soldiers was just a contributory factor. Even the Communist theorist Karl Marx endorsed the view that the uprising of the Indian soldiers against the British Indian government was nothing but the first war of Indian independence. (V.D. savarkar also stated 1857 sepoy mutiny as first war of Indian independence) The Doctrine of Lapse, an act brought forth by the Governor General Lord Dalhousie angered the Indian princes. This act bars the adopted children of the king of a native state from becoming legal heirs of the kingdom. It is a known fact in history that this act spurred Lakshmibai of Jhansi to wage war against the British Indian government, as her adopted son was not recognised by the British as her legal heir to the throne. Hence many rulers of native states and Zamindars also actively support the war. Another contributory factor was the creasing of the Enfield bullets with animal fat. It was rumoured that the bullets were creased with the fat of pig and cow which provoked Muslim and Hindu sentiments as well. The war which started on 10th May, 1857 in Meerut gradually spread to Lahore, Madhya Pradesh and Uttar Pradesh. The revolutionaries occupied Delhi and enthroned the Moghul ruler Bahadur Shah as the emperor of India. The British Indian Government successfully put down the revolt and exiled Bahadur Shah. By the time the first war of Indian independence started, the country was under the rule of the East India Company. The country shifted into the direct rule of the British Government under Queen Victoria on 1st November, 1858 A.D. The majority Hindus and the minority Muslims also expected their ruler- the Nizam to fight the British shoulder to shoulder along with the other princes of the native states. But sadly the Nizam Afzal Ud-daula and his minister Salar Jung adopted pro British stance. The Umraos and Sardars under the leadership of Shams U1 Ullah supported the Nizam’s pro British policy. The British also acknowledged the Nizam’s support by heaping praise on him. The Governor of Bohibay in a letter to the Governor General acknowledged the fact that but for the Nizam strong support, the British would have lost the South. Thanks to the Nizam’s friendly attitude to the British, the discontent of the people was suppressed. Yet here and there the voice of discontent was heard, though feebly. As soon as the news about the revolt reached the state of Hyderabad people reacted emotionally. Posters appeared on the walls of mosques and churches urging the people to rise in revolt against the British. The posters urged the Nizam to lead the revolt on the name of the almighty Allah. If he was a coward, he may wear bangles and hide himself in his house. Maulvi Ibrahim and Maulvi Allauddin played key role in exhorting the people to rise against the British. When the Dewan Salarjung came to know about it, he summoned the Maulvi Ibrahim and warned him that he might be booked on charges of treason. The dewan reasoned that though the British belonged to a different religion (Christianity), Jihad against them was not advisable, as the British were friends of the Nizam. The Dewan stationed Arab soldiers at Mecca Masjid as Maulvi Allauddin urged the Muslims assembled there for Friday prayers to rise against the British. But the Muslims fled on seeing the sol¬diers. The British had a pact with the Nizam to have its contingent army at Secunderabad quarters and at other important quarters which brewed trouble. The resident Colonel Davidson in a letter to the British Indian Government explained that the faith¬fulness of a native state was the strength of the British in India. He assured that the British Government would remember with gratitude the invaluable service rendered by the Nizam during the critical time. The first and second cavalry of the contingent army stationed at Aurangabad refused to obey orders from their superiors. The two units refused to move out of the borders of the Native state of Hyderabad. Jamedar Amirkhan and Dafedar Mir Fida Ali led the two units. Mir Fida Ali was arrested, court marshalled and hanged till death. While his dead body was hanging from the gaol, cavalry, infantry and cannon force marched by, to create fear psychosis among the Indian soldiers. Jamedar Amir Khan somehow escaped. All the soldiers of the first cavalry were dis-armed. In the entire episode one rishaldar, three jamedars, nine dafedars, 76 soldiers and four sol¬diers of military band were disarmed. Later 21 of them were shot dead. Three more were put before the cannon and fired. At Mominabad three dafedars and six soldiers were arrested. Abbot, the captain of the contingent force describes the gory details in a letter, which runs as follows: We have killed many prison¬ers out of the 94 we arrested. One was hanged to death. Four were shot dead. One was put before the cannon and fired. The outcome was so violent and bloody that the victim’s head flew into 20 yards high and arms fell apart eight yards to each other. When I told them about the nature of the death they were going to receive, they received the news with great serenity. It surprised me. 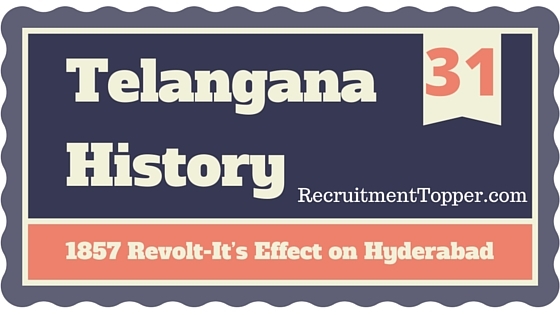 The contingent forces of Hyderabad State in Buldana also rose in revolt. As a result of this, many of the soldiers were arrested. About ten of them under the captainship of Chidda Khan escaped to Hyderabad, hoping that the government of Nizam would provide them asylum. Maulvis to the Nizam to urge him to release Chidda Khan and his followers. They had also resolved to raid the residency premises in case the Nizam did not accede to their request. The Dewan got news about the proposed meeting at the Masjid. He sent a troop of Arab soldiers to the Masjid. On seeing them the Muslim devotees fled. Later he sent word to the Residency that there was no cause for alarm. But a few hours later he received news that a mob of about 300 Rohillas under the joint captainship of Turrebaj Khan and Maulvi Allauddin was marching towards the Residency. The Dewan was alarmed and again sent word to the Residency about this. He cautioned that the Residency had to defend itself till he (the dewan) would rush the Nizam’s soldiers. The Rohillas marched towards the Residency through Sultan Bazar that connects Hyderabad to Secunderabad on the western side of the city. Meanwhile Abbas Saheb and Jayagopaladas who helped the Rohillas occupied the devidies on way. The Rohillas demanded the release of Chidda Khan and his associates. Colonel. Davidson took upon himself the defence of the Residency. It was already dark by then. He was reluctant to engage the Rohillas in firing. He just moved the Arab soldiers around the mansions where the Rohillas were lurking. •Meanwhile the Rohillas demolished the wall that separated them from the Residency and marched forth demanding the release of Chidda Khan.This provoked the Residency into firing in the direction of the Rohillas. The firing continued till early morning 4’o clock. The Rohillas, unable to bear the incessant firing from the Residency fled from the mansions they occupied. The Arab soldiers stationed there to guard them, helped them flee. They carried the injured with them but left four dead bodies.Turrebaj Khan who led the attack was arrested at Mogulguda, but was injured in the scuffle. He was tried’and exiled. But on 18th January, 1859 he escaped. The government announced a reward of Rs.5000 on his head. On a fateful day, with the help of one Kurbani Khan, he was caught at the village Tuphran. This time he was killed in the firing by the British police. His body was taken to Hyderabad and dangled with shackles at a public square in the city for some days apparently to teach a lesson to the revolutionaries. Maulvi Allauddin who was in the forefront of the attack, fled to Bangaluru. But he was arrested at Mangalampalli and tried in Hyderabad. He was exiled for life to Andamans, where he died in 1884. The attack on British Residency was the only major attack during the first war of Indian independence. Though the government suppressed the attack with an iron hand, all was not well with the people as well as the state. The members of revolu¬tion glowed for another decade. The emissaries of the 1857 heroes, Tantia Thope, Nana Saheb, Rao Saheb Peshwa etc., paid secret visits to Hyderabad state to urge the people to revolt against the British rule. The rebellion by Raja Venkatappa Naik in Sholapur, the conspiracy by the Rohillas at Nirmal, the tribals (Bhills) at Ajantha, the revolt by Ramji Gond in Adilabad, the uprising at Kolas by Rangarao Patwari and the grand conspiracy on the name of Rao Saheb Peshwa were the members that kept the revolution going on, though, in a mild way. As a result of this, the native state of Hyderabad faced critical times. Rao Saheb Peshwa alias Rama Rao supposed to be a close relation of Peshwa Nana Saheb was the architect of a conspiracy in Hyderabad, in 1862 which was a sequel of ‘1857.’ . Rama Rao came to Hyderabad in March, 1862 and lodged in Balamukund temple garden which belonged to Kishanlal Sahukar. Rama Rao won the favour of Rukma Reddy, zamindar of Marthad, Amur taluq, Raja Reddy, chief of the Nizam’s irregular army, Chavan Raja popularly known as Cantonment Raja etc who assured him their coop-eration in money and material. A liquor business company under Puranmal also offered him financial help.Though the Dewan Salar Jung came to know about the conspiracy, he did not take it seriously. He dismissed it as the ‘plans of some low levels.’ But he realised the huge proportions of the conspiracy gradually. Rama Rao was arrested on 4th March 1862 but escaped detention. Then the government announced Rs.5000 reward who provided information leading to his arrest. But he could not be arrested. His dewan Kishan Rao and a Telugu lady who sheltered him at Balamukund temple garden also escaped. Rama Rao escaped from detention twice this way. Once a jamedar went to Begum Bazar to appre-hend Rama Rao as the Jamedar received information that Rama Rao was residing in Kishan Rao’s house. But the neighbours there thwarted, his attempts. Sometime later, the dewan sent a force to arrest him at Narsing. But the kothwal of that vil¬lage refused to cooperate with the force, branding it a group of bandits. Rama Rao and his close aide Kishan Rao were never caught. But the Nizam government arrested 59 persons in the process and tried them. Of them 40 were convicted on various counts. Rukma Reddy, the zamin- dar was given life imprisonment and kept in shackles permanently. Kishnalal’s child was fined for Rs.75,000 as he was a minor. The business organisation Puranmal had to pay a fine of Rs. 10,000. Ram Rathanji, who reportedly provided shelter to Rama Rao, committed suicide soon after arrest. Thus with these convictions were the embers of’1857′ put out. The Nizam Afzal Ud-daula derived many benefits through ‘1857.’ from the British Indian government. 2. The Nizam was given back Raichur and Osmanabad which the British had taken earlier’ in 1853 as compensation. 3. The Nizam’s dewan Turab Ali Khan was given the title Salarjung. 4. The Nizam’s dues of Rs.50 lakhs were waived. 5. The Nizam was allowed to mint coins with his picture instead of the picture of the Moghul emperor. ★ In Nirmal the leader called Ramji Gond and in the Rohillas leader called Miya Saheb Khurd jointly fought against the British. 1. The group which were not supported to 1857 revolt? 2. Who called that the 1857 revolt was a first war of Independence? 3. The military revolt which started on 16th May 1857, gradually spread to which areas? 3. Uttar Pradesh 4. All the above . 4. In which year, Indian administration went into the hand of British Queen Victoria? 1. 1st November, 1858 . 5. Who declared ‘Jihad’ at Kadapa against the British? 6. The influence of 1857 revolt is heavy at which area? 7. Who Said that ‘if the peace in Deccan con-tinued uninterruptedly, we must depend on the faith and good will of native princely government through’? 8. Which areas were obtained by the British Nizam for the maintenance of British forces stayed in Hyderabad in the year 1853? 9. Who lead the military revolt of cavalry started in Aurangabad? 10. Who lead the contingent military revolt in Buldana? 11. The year in which, rebels attacked British Residency? 12. Who attempted to attack the Residency? 13. Whose followers instigated people against British while roaming through the Nizam kingdom? 14. Among the following which one is correct? 3. The coins of which are having the imprint of Moghul emperor were removed from circula-tion . 15. In which areas muslims declared ‘jihad’ against the British? 16. In whose name, the conspiracy held in Hyderabad in the year 1862? 17. Among the following which one is correct? 18. Who committed suicide, for the crime of giving a shelter to Rama Rao? 19. Rukma Reddy under went for life impris-onment for giving shelter to whom? 20. Who started wahabi movement?